So much for the game market being destroyed. Two days later and it is as if the poor quarter from EA never even happened. Eh? What Bad quarterly earnings report do you speak of? Activision (ATVI) hasn’t recovered anywhere near the degree EA did, Nintendo (NTDOY) is not far from 52-week lows, Take Two Interactive (TTWO) hasn’t regained much of what they lost & NetEase (NTES) is still off big. 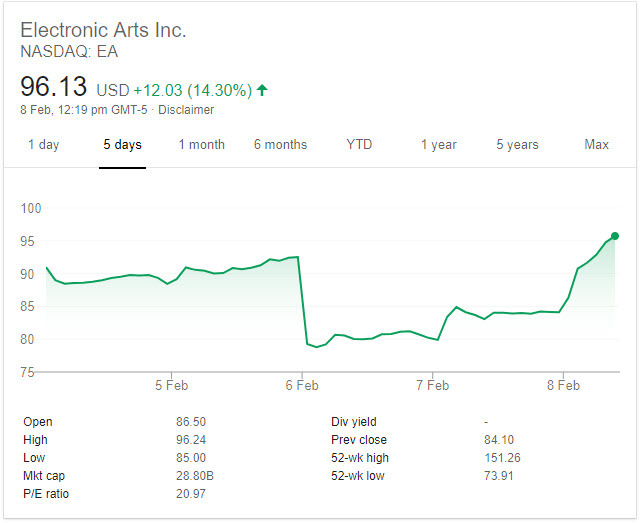 Gaming company stocks after EA quarterly results announcement. Yesterday after the adverse market reaction to the Kudlow US – China trade war news coverage I saw XOM was down almost 2%, so I bought a chunk of it as today it went ex-div. I sold that shortly after open today for about a half a percent loss BUT about a percent gain in the quarterly dividend payment that will be paid in a month, so it was net up a half percent on a decent sized position. It was a good thing I sold when I did as it has been down, down, down since open & looks like it could slide below $73 today if the market doesn’t turn up soon (edit: yup, it did, $72 & change). I was also holding a bit of FNKO that I sold for a small gain this morning. I still have a small position in Nintedo that is off a bit over 3%, but made a similar amount from going in and out of EA & ATVI a couple times. I suspect whenever Google launches the next version of their Switch they’ll get a bit of a bump. I still have a position in Google along with a bit of Disney & Apple that were purchased about a year back. I’m quite glad to be mostly in cash while the market is choppy, another U.S. federal government shutdown could start next Friday, and the March 1st trade war deadline is only 3 weeks away. Today Henry Schein finally spun off their veterinary supplies division into a new publicly listed company merged with Vets First Choice. The ticker symbol for Covetrus is CVET. Quinstreet is off about 20% today after meeting expectations . They saw weakness in their core legacy markets of online education (secular declines as the for-profit colleges are ultimately displaced by the nonprofit universities who have partnered with entities like 2U & they lost a large client in Dream Center Education Holdings which is going through restructuring) and home loans (cyclical market softness in response to rising rates hitting refi demand), but saw stronger growth in their other verticals including insurance, credit cards, personal loans, banking, home services & B2B. On the quarter they grew revenues YoY by 19% to $104.1 million. Financial services is 71% of revenues. Education is down to 16% of their revenues. Their recently acquired AmOne personal loan business (which they paid $20.3 million for plus earn out of up to an additional $8 million) is within striking distance of being their #2 revenue driver behind auto insurance. Almost a year ago Kerrisdale Capital Management published an article on SeekingAlpha highlighting how there is a lot of ingredients in the insurance leads sausage.